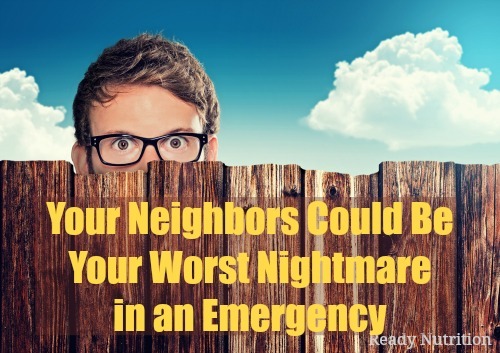 Today’s neighbors can morph into tomorrow’s marauders in the blink of an eye. ReadyNutrition Guys and Gals, this piece summarizes one of the episodes of “The Twilight Zone” entitled “The Shelter” that bears mention for all who have neighbors, especially those they are “unsure” of. In this (two minutes to midnight) preparatory lifestyle, it’s always important to know about those who live around you. The fragile nature of our society is best described as the thinnest of veneers of civilization overlaying an underlying barbarism that can manifest itself at any given moment. “The Shelter” is an excellent case-study of such a precept that I recommend to everyone to watch at least once. This is of the original series, and the episode was written in 1961 by Rod Serling. The story commences in the home of a neighborhood doctor where he and his neighbors are celebrating his birthday. Everyone is festive, and the mood is one of good spirits, laughter, and indulgence in food and drink. After a birthday toast, several birthday guests comment (abrasively) on the noise the doctor has had over the months from the construction of a bomb shelter in his basement. The doctor kind of ignores it, and the party continues. Needless to say, all of the guests frantically depart. The doctor and his family scramble around, filling up jars with extra water and moving some extra stuff down into the bomb shelter. In the shelter were beds for the family and shelves with canned goods and medicines, as well as other gear and some chairs and a table. The doctor returns upstairs, and then one of the neighbors, Jerry, begins rapping on the window. The doctor opens the door, and Jerry worms his way in, slyly informing the doctor that he and his family are unprepared for what’s coming. The doctor refuses, and the men outside move away from the door, and then begin to argue among themselves. There is already infighting about who (of the outsiders) will enter the shelter, as the men move out of the house. “Bill, who are those people?” the mother asks. “Those people…those people are our neighbors…our friends…the people we’ve lived with and alongside for twenty years. C’mon, Paulie. We better get up some of this furniture and this bunk so we’ll have some protection in case that door goes through,” the doctor said. The half-dozen men return to the house, smashing up furniture in the dining room and trashing the house. They enter the basement with a heavy pipe, and as their wives cheer them on, they begin battering the shelter door. Presently they break through. Just as they are stepping into the shelter, the radio in the shelter with the family announces that the previously-spotted objects were satellites, and the alert was lifted. The episode is excellent, and in under 25-minutes presents exactly what human nature boils down to…in a non-profane, “Hallmark” version with no blood or gore to offend the tender sensibilities. The doctor made the following critical mistakes. The old adage, “Know thy neighbor” holds true…and not just from a superficially-friendly, good time perspective. What is important to know is that when the needs of the neighbors are not able to be met, those needs will be attempted to be filled at your expense if you are the one with the supplies and safe haven. “The Shelter” is an oldie but a goodie, and a perfect tool to keep in mind that all of us can pass beyond the limits of the “better angels of our nature,” and the situation turn from “Rebecca of Sunnybrook Farm,” to “The Road Warrior” in the blink of an eye. Happy watching, and hope you take something from it. JJ out! I’ve long held the belief that those unprepared neighbors who have young children will likely be some of the most dangerous. Many of these parents will quickly justify any act of extreme violence against their prepared neighbors in an effort to prevent the slow starvation and suffering of their own children. Never ever tell anyone even in your church or workplace, relatives even, about your preparations or what you are buying. I can’t imagine anyone with common sense blabbing personal stuff that could get their family killed. It seems to me that the preppers are the worse neighbors and the paranoid ones who will threaten others in times of crisis. I want nothing from my neighbors. Stay away from me. But the idiot, redneck preppers who litter the hills around me are so paranoid about running out of resources during the “apocoplypse,” they are the unstable threat to others. I’m armed and can take care of myself. Preppers keep out and keep your greedy little hands off of my stuff. Dogs got to eat to. Basically you are on your own. The U.S. is not the same country it was before WW2. Morally and spiritually it has declined and been replaced by greed and avarice. Racially is has never been so polarized and even with in racial groups there is conflict and division. The myth that rural areas will be better then urban spaces only holds true because there are less people. But in many rural areas people , even of the same race hate each others and bicker over land and boundaries. I believe that any invasion of the U.S by Russian would be met with much of the population siding with the invaders after the American military is brought down, which won’t be a very hard task with the watered down divided and dispersed armed forces. Once the American technology is overcome it will be a fairly easy task to win a war against the U.S. with MAD still in place much of the fighting would rely on the moral courage and fortitude of the American people which under BO is virtually nonexistent. I believe it would be a good idea to learn a few words of Russian. As one snake eater to another ~ thanks for the reminder! Remember. That muslim friend becomes islamic with the proclamation of jihad! If anyone in my neighborhood is not prepared, that means one of several things, and I am prepared for them. Let us hope that a few pieces of hot lead will convince them how stupid they were first for not being prepared, and second thinking they could make up for it by trying to take my preparedness as a weakness. Saw the Road the other night. Very depressing. Probably most likely scenario. If it comes down to a situation like “The Road” there is only ONE PERSON that is going to save your azz – Yahweh, the one and only true living God. I recommend praying to Him by His name – YAHWEH, not just God, or Heavenly Father. Call God by His NAME. Read Psalm 91:14 to see what I mean. He has a name and He wants us to call Him by His Name. You will be rewarded by doing so. Save your breath their in for a ROOD AWAKING.